Growing your own food is fun, but the really special part comes when you sit down to the dinner table and the main course is something you grew yourself. Potatoes are a great crop for small spaces, because they can be grown in containers. They are also super easy to cook with. There are so many delicious ways to eat potatoes! Garlic is another easy to grow plant for beginning gardeners, and using fresh garlic makes a big difference in taste. Using your own rabbit or chicken stock means it’s almost totally homegrown. 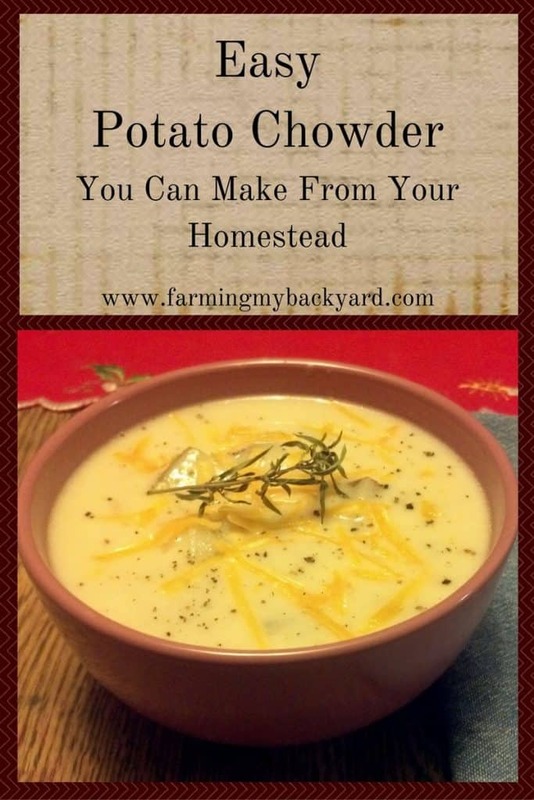 One of our favorite ways to cook them is this potato chowder adapted from the oyster chowder recipe in Nourishing Traditions by Sally Fallon . This chowder makes a frequent appearance even on holidays because we like it so much and it’s kid friendly. It’s simple, yet yummy. It can be fancy or basic, depending on how you present it. Add clams or bacon or cheese, depending on your mood and enjoy! Saute onion and garlic in butter until the onions are very soft. Add the flour and let cook for a few minutes. Add the stock and bring to a boil before adding in potatoes. Simmer until the potatoes are soft. Turn off the heat and add the cream and salt and pepper.